This dear, sad little church sits on its own just off of the Mundford to Swaffham road, right beside the forbidden zone of the Battle Training Area. Its near neighbour Langford has been inaccessible to the public for more than half a century now. 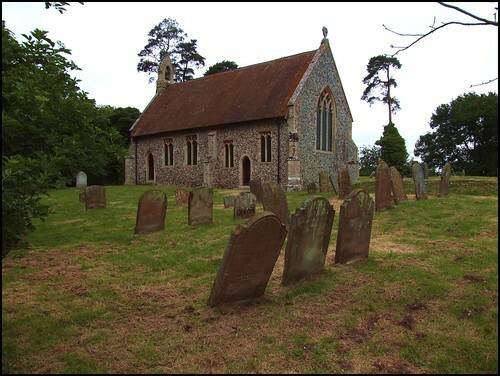 There is no village, and in terms of population this is one of East Anglia's smallest parishes. Although the windows were all renewed in the 19th century, the tracery corresponds to earlier drawings. Most likely, this is a Norman single cell church in origin. Probably, there wasn't the money locally in later medieval times for a rebuilding, just enough to make the tracery briefly fashionable. You step into an endearingly rural 19th century restoration, which was done with a light hand. There is a haunting range of benches, with renewed ends, but the surviving late-medieval traceried backs, and the font is plain and simple early 15th Century. The Victorians found the rood loft stairs which the Anglican reformers had blocked, and it is now exposed. Curiously, the single length of the building is divided by a proper chancel arch and wall - you couldn't tell this at all from the outside. Along the nave walls are oil lamp holders. The scarlet banner, which was used to lead processions in the early years of the 20th Century, is embroidered with three simple primroses. It is delightful. On a shelf sits a small, slightly battered plaster statue of the Blessed Virgin and child, and it seems an appropriate single adornment to this quiet, empty little space. And St Mary would be a forgotten, endangered church if it were not for one simple fact: the parish keep it open every day. This transforms it from a dying church into one which is full of life and love, a wayside shrine for pilgrims and strangers. How I wish that other tiny, obscure parishes would learn this lesson.